The STV TL5 is a 5 Ton, 7 m long terrain vehicle with a load capacity of up to 3500 kg or 20 passengers. The TL5 has extremely good off-road capability; it can handle gradients up to 45 degrees lengthwise and 30 degrees sideways. This is a brand new product that will fill a gap in the tracked off-road industry. For the first time there is a faster alternative to the two-track, Snow Groomer type machines with similar price and ergonomics. For quick personnel and light to medium off road transports, the TL5 is a giant leap forward. … thanks to the built in flexibility. – Euro 6 engine with very low emissions. – State of the art user friendliness. – Lowered operator’s costs, thanks to high volume truck spare parts and low fuel consumption. – Comfortable in speeds up to 60 km/h. 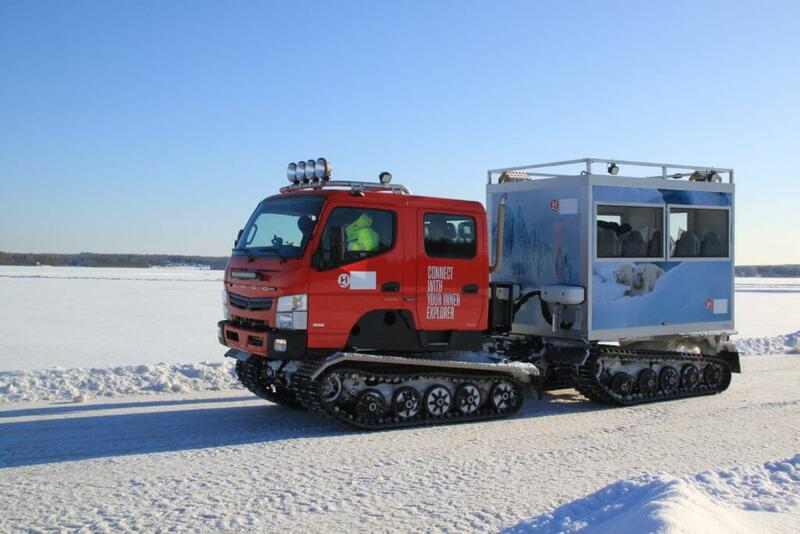 The STV TL5 tracked vehicle has the same nimble size and impressive off-road capability as the famous Hägglunds BV206, but with modern standard user friendliness, comfort, and environmental footprint. Off-road capability is the key to success. TL5 enables rapid response in all terrains. The vehicle off-road ability allows it to conquer slopes, gaps, marchland and snow in any environment. Whether your mission is to transport equipment or to transport people you can always rely on getting there even if you have to cross deep snow or rocky mountains. It is easy to maintain and yet extremely durable. For us, it’s not just about selling a tracked vehicle and then walking away. It’s about finding the right product for you and your customer, getting to know your business and helping you to continue to get the best from your TL5 throughout their lifespan. That’s why we offer a wide array of service packages. It encompasses everything you need to keep your machine running and minimal cost to you. The electronic and automatic 6-speed gearbox makes for a transmission that is both soft and efficient. The articulated steering unit and four tracked drive system provides the highest off-road and mobility over obstacles, reducing risk of mission failure. Different terrain and surfaces, diverse types of weather and climate and all manner of industries no matter where you are and what you do for a living, the TL5 will prove just as useful. Please fill in the form below to know more!